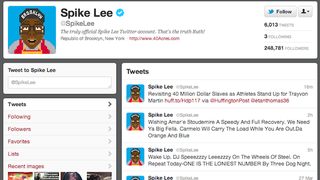 Spike Lee, sometimes movie maker and recent Jeremy Lin jersey wearer, made a pretty big boo boo recently. He thought he had retweeted an address of George Zimmerman, the guy who shot Trayvon Martin, but actually retweeted an address of an elderly couple in their 70s to his 250,000 followers. According to The Smoking Gun, the original tweet of the wrong address was sent to Spike Lee by Marcus Higgins, a 33-year-old who had sent the address to other celebrities too (LeBron James, 50 Cent, etc.). The original tweet came with a not so innocuous message that told followers to "feel free to reach out and touch him." Spike, thinking the address was the shooter, re-tweeted the message in full to his followers.